Small pockets, red tag detail with contrasting stitch accents. Sturdy D-ring for safe walking. Walking your dog shouldn't be a chore, it should be a fashion statement! 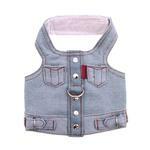 Not only is this Blue Jean Jacket Denim Vest Dog Harness by Doggles adorable, it is durable and useful on walks. 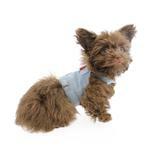 For little dogs that want to look tough, this rugged denim look features details you'd look for in your own jean jacket. A red tab accents one of the small pockets. Contrasting stitching makes the look authentic. Rivets and buckles provide ruff-and-tumble style! 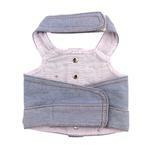 Our Doggles denim vest harness is sturdy yet soft. The D-ring leash attachment is reinforced for security and strength. The heavy duty touch fastener closure at the neck and chest are easy to use and provides an adjustable fit. Make sure your pup looks stylish by wearing this season's most fashionable dog clothes. This denim dog harness dress is perfect for shopping, barbecues and anytime your pup will be getting together with the gang. Blue Jean Jacket Denim Vest Dog Harness by Doggles Customer Photos - Send us your photo! Kookii here, chillin' in her new denim jean jacket harness vest. It is even great for walks. Scoobie riding shotgun, wearing his blue jean harness. Paltrow got a new little baby brother, Pico. So he just had to have a matching denim harness vest. Now they look so cute together wearing these little vests together and they are great harnesses also. Hachi is a nineteen month old male. He loves to fetch on the beach. Paltrow looks adorable in her casual denim harness! Posted On 08/14/17 by Penny D from Lakewood, CO Yes, Penny D recommends this product! This is the cutest little jean shirt. It even has the little red label on it. Very well made. I really like this harness, but had to alter it to fit a bit. I probably could have bought one size smaller, but according to the chest measurement, I bought what was recommended. Totally adorable, lots of compliments on how cute it is! Posted On 06/26/17 by Lynda M from Seattle, WA Yes, Lynda M recommends this product! I bought two of these - one as a gift and one for my own dog. They are so well made! My dog is between a small and extra-small, so I had to do a bit of alteration, but that was fine - this is a wonderful harness that will last a long time, and my dog doesn't mind wearing it, although he generally doesn't like clothes. This is a very cute denim harness that looks great on my male mini Yorkie! We get many compliments every time we take him out in public. I highly recommend this harness! Posted On 11/19/16 by Maggie M from Mesa, AZ Yes, Maggie M recommends this product! Great little Harness. Perfect for Frenchie! Posted On 06/09/16 by Jan K from Peoria, AZ Yes, Jan K recommends this product! This is made so well and I love it on my little girl! It runs a little big so make sure you measure or it will be a little saggy. It's great quality! Posted On 03/26/16 by Jan K from Peoria, AZ Yes, Jan K recommends this product! Posted On 03/22/16 by Linda G from Louisville, KY Yes, Linda G recommends this product! OMG! This is the cutest harness EVER! Nice fit. The quality was much nicer than pictured! So cute, plus useful with the attachment, use it in warmer weather. Posted On 01/19/16 by JUDITH EMRICK from CLEARWATER, FL Yes, JUDITH EMRICK recommends this product! I THOUGHT IT WAS ADORABLE. VERY WELL MADE. THE ONLY THING WRONG FOR ME WAS THAT IT WASN'T QUITE BIG ENOUGH. I NEEDED AN X-TRA LG. Posted On 11/02/15 by Karen O from New York, NY Yes, Karen O recommends this product! I have two morkie puppies that are absolutely adorable, but when you put this vest on them the cuteness goes into overdrive! It's easy to put on them and since the straps are made of velcro and theyre still growing I'll be able to adjust how tight the harness can be. I would definitely buy again. My pups are approximately 2 pounds, this harness should fit well enough on a pup that is at least 5 lbs. The Cutest Thing I've Ever Seen! Posted On 09/14/15 by Marie O from Hoboken, NJ Yes, Marie O recommends this product! Posted On 06/03/15 by Kimberly A from Sarcoxie, MO Yes, Kimberly A recommends this product! Absolutely adorable. Great quality and a great price. Got it for my male Westie and the little denim dress for my female. I bought this as a gift. Looks cute and well made. Love this denim vest harness. Fits great and looks great on Coco. I bought quite a few clothing items from Baxter Boo. Quality is excellent & shipping is always quick. I love this harness. The ring is strong & is in perfect position for the pet carrier on the Harley. When we wear our denim jackets on the Harley, Annie wears hers, too. Easy to use, quick on and off. The very wide velcro on the tummy area eases her minds that she is safe on the bike with us. Only suggestion would be to put a bigger and heavier ring on the back. Would like some larger sizes on some of the dog dresses. Almost everything is made for small dogs but it would be nice to have an option for bigger dogs too. Also many of the most popular and cutest were out of stock in several sizes.